Educators understand how important it is to bridge the gap between school and home. Educating a child, especially when it comes to STEM-infused instruction, takes a village—especially today. With all the things our teachers are expected to accomplish in their classrooms, time is certainly limited when it comes to diving into STEM topics. Because teachers only interact with students for a fraction of the time parents do, it is imperative that learning continues at home. Students are assigned lessons in class as per a normal school day. With a few clicks, teachers send relevant multi-media content to parents via ParentGrams. Parents and students watch and discuss the content, learning together. ParentGrams are the perfect liaison between school and home, readily accessible via iOS or Android apps. Families can chat about the lessons around the dinner table, on the way to practice, or any other time that works for them! Empowering parents with high-interest content and the flexibility busy families crave, ParentGrams are a convenient and simple way to enrich student learning. 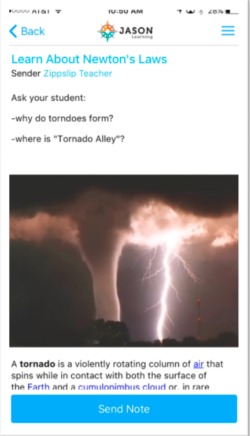 Because these lessons are full of exciting stuff like video snippets of tornados touching down or footage from deep within the rain forest, they make for more engaged learning and more successful academic outcomes. Oh, and don’t worry, already overworked and exhausted educators: sending a ParentGram doesn’t require any extra planning on your part! For your convenience, JASON*Family has pre-populated the content which is accessible through the JASON Learning primary dashboard. The system automatically creates your ParentGrams, which you then share with just a few clicks, or if you’d rather personalize the content, you have that option as well. Don’t just imagine what we could accomplish if we worked together; make it happen! Contact JASON Learning or ZippSlip for more details.